Hada Labo, the Japanese skincare brand, has launched a range for sensitive skin, the ES range. ES actually stands for "Enjoy Skincare" - the idea being that with the ES range, even sensitive skin can enjoy a full suite of skincare products. If you've seen the ads for Hada Labo, a sellling point is that the products are fragrance, colourant, preservative, alcohol, and mineral oil-free. This new Hada Labo range has Hyaluronic Acid, which is the ingredient that most consumers associate with the brand, but the sensitive skin line also features some forms of Zinc Hyaluronate in some of their products. The inclusion of Zinc Hyaluronate is an interesting one - Zinc Hyluronate is a salt that has some effect in helping wound healing, and is the main component of Curiosin, a preparation for wound care. This seems like a good choice, as I imagine that since sensitive skin is prone to being aggravated, an ingredient like this would help. I've had good experiences with Hada Labo in the past - I'd say that I've yet to try a product from them that was a total failure. So of course, I was keen to see if this would continue to live up to what I've expected from the brand. The range has just four products - a makeup remover, a foam wash, a lotion, and a milk (I guess similar to a toner and moisturizer respectively, although both feel like light moisturizers to me). This isn't a very large range, given that lots of Asian brands are fully capable of giving you a range that's upwards of 8 products. If some of these brands are to be believed, you can't just "cleanse-tone-and-moisturize" your skin any more, you now have to "cleanse-exfoliate-tone-serum-essence-moisturizer-eye cream-whatever-else" your skin every night, which I find more than slightly ridiculous. But fortunately Hada Labo has chosen to keep it simple for their ES range, which in my opinion, is a good thing as far as sensitive skin is concerned. So let's take a deeper dive ito the products in this range. First up, we have the ES Sensitive Skin Foam Wash. At first, I was thinking, "Oh my, another foaming wash?" But when I tried out the product, I found it to live up to its claims. It didn't actually leave my skin dry the way some foam washes have in the past. In fact, if anything, I found the Foam Wash to be too gentle - I think this is the first time I've ever had this complaint! But it did clean my skin sufficiently. 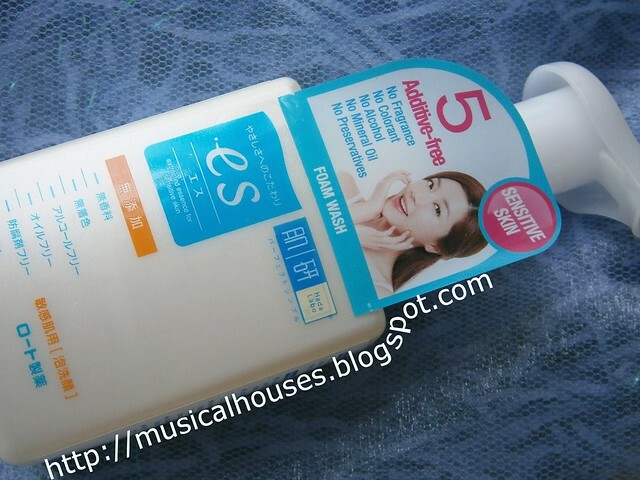 Hada Labo ES Foam Wash - great for sensitive skins who want their foam! Like other foam washes, this one comes out in its foamy glory straight out of the pump. The novelty for foam washes has worn off, of course, as it's been awhile since the first foam wash hit the market, but a foam wash that is gentler on your skin is always a good addition to the market. Look at all that foam straight out of the bottle! If you look at the ingredients list, you can really see the effort Hada Labo has put in to make the Foam Wash suitable for sensitive skins. Most foaming face washes are quite heavy on the surfactants and thus can be a little dry, so Hada Labo has used TEA-Cocoyl Alaninate and Sodium Cocoamphoacetate as its primary surfactant, and both are quite mild as surfactants go. 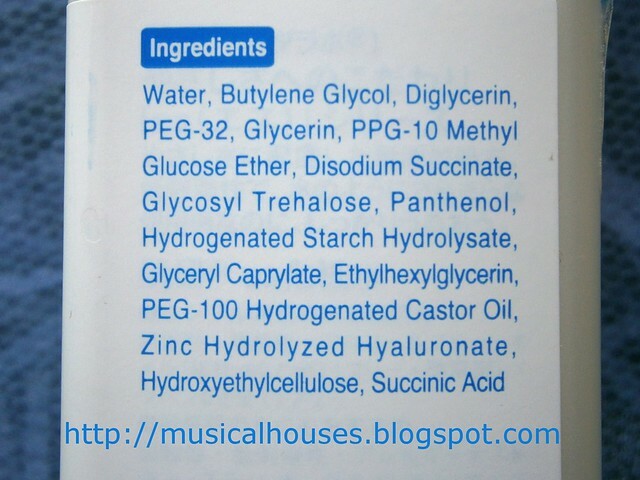 There is also Zinc Hydrolyzed Hyaluronate, the wound-healing agent, but since cleansers don't stay long on the skin, I doubt this particular ingredient will have a large effect on skin when used in a cleanser. 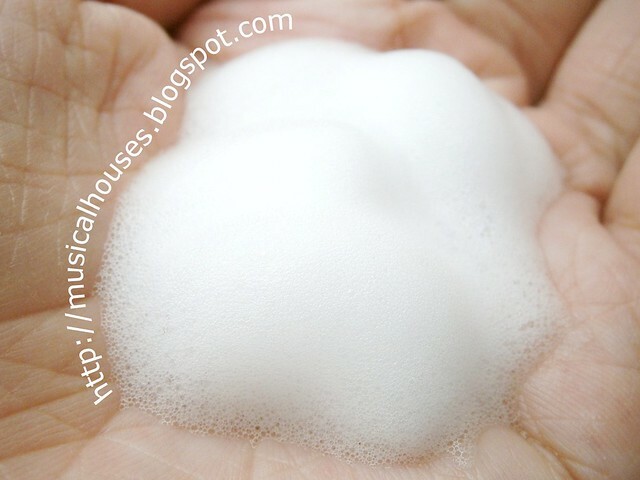 Mild surfactants make the Hada Labo ES Foam Wash a very good cleanser for sensitive skins. The next product in the range is the ES Makeup Remover. This is one of my favourite products, which came as a surprise to me. At first, I was thinking, "Another makeup remover, nothing special, pffft." But then I tried it out, and came away totally impressed! Hada Labo ES Sensitive Skin Makeup Remover: Gentle, but works well. The Hada Labo ES Makeup Remover is actually very watery in texture, which was something I didn't quite expect. It has a light feel, akin to those of micellar cleansers. But unlike some micellar cleansers, tt doesn't have any smell that I could detect when I used it. To me, this feels and smells just like water. The Hada Labo ES Makeup Remover has a light, watery texture that is easy and pleasant to use. Look at the effectiveness of the Hada Labo ES Makeup Remover! This is my standard test that I use to effectiveness of any makeup remover. 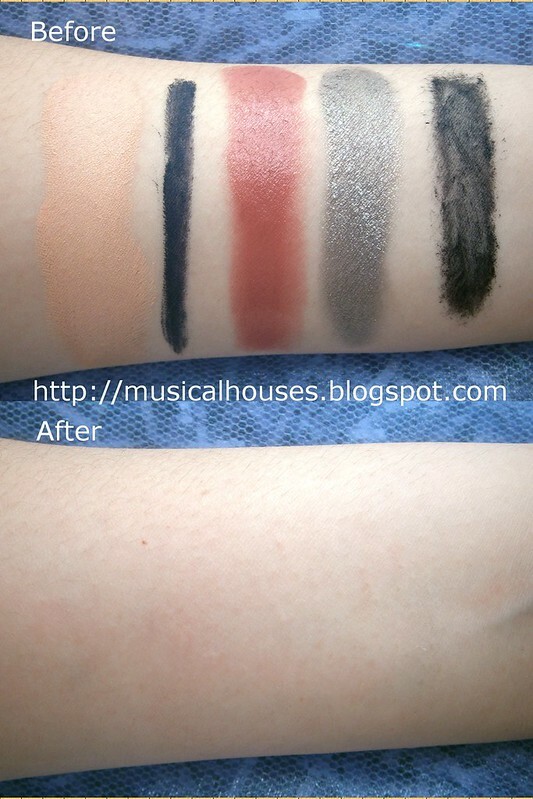 I put on my arm, from left to right, some of the toughest hardest-to-remove products in my makeup arsenal: a stay-all-day concealer (Laura Mercier Secret Camouflage), a long-lasting gel eyeliner (Bobbi Brown Indigo Gel Eyeliner), a long lasting creamy blush (Bobbi Brown Pot Rouge in Flushed Pink), a doesn't-budge-once-set cream eyeshadlow (Prescriptives Colorscope Creamy Eye Color in Smoking Gun), and a waterproof Eyeko Mascara. These are basically what I wear when I want my makeup to last all day. (I even wore the eye makeup to a water park once, it turned out fine). And the Hada Labo ES Makeup Remover cleaned out all the makeup completely! Hada Labo ES Makeup Remover: No major irritants. 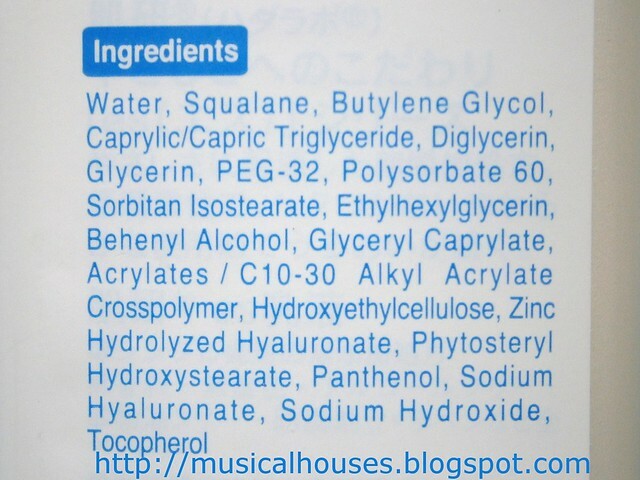 Above are the ingredients list for the Hada Labo ES Makeup Remover. The good thing about this is that nothing in the ingredients list jumps out at me as potentially aggravating for sensitive skin, yet it still somehow does its job. This is a really fantastic products - a lot of makeup removers tend to leave my skin feeling a little battered, but this doesn't. There's also Zinc Hyaluronate in there, which helps to lessen the aggravation. We also have the Hada Labo ES Sensitive Skin Lotion. This is a lightweight moisturizer, and is quite similar in texture and feel to Hada Labo's SHA Lotion. Same plastic flip-top bottle, same watery texture. Performance-wise, this also acheives a similar effect on the skin as the SHA Lotion. Its primary function is to moisturize the skin, and indeed it does provide good hydration. It is also quickly absorbed and doesn't leave my skin feeling sticky. 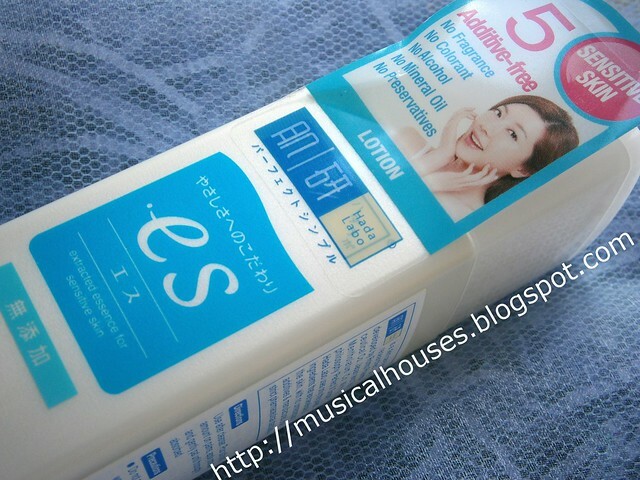 Hada Labo ES Lotion for Sensitive Skin: A very hydrating but light moisturizer. 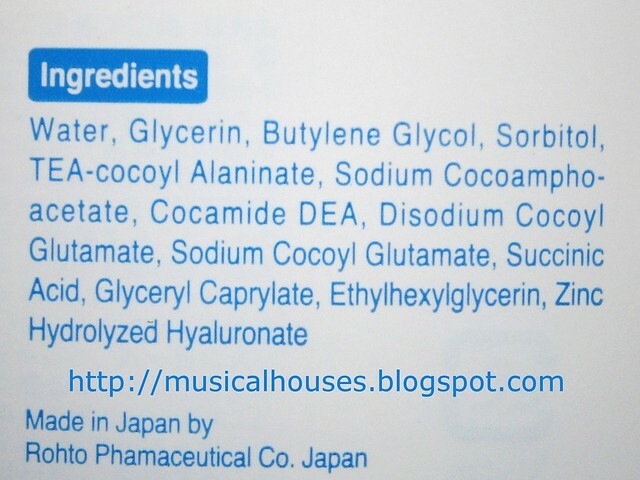 In the ingredients list, there is also some similarity to Hada Labo's own SHA Lotion. Both products are mainly comprised of Water, Butylene Glycol, Glycerin, and PPG-10 Methyl Glucose Ether, that is, water and solvent, together with a bunch of humectants and emollients to help hydrate the skin. Although I thought the original SHA Lotion was probably suitable even for sensitive skins, the ES version has been tweaked for those skins that are ultra-sensitive. There is the addition of Zinc Hyaluronate, which as I've mentioned before, helps with wound healing, and is quite a nifty addition for aggravated sensitive skin. But I also really like the addition of Panthenol, as it helps to moisturize and lubricate your skin. 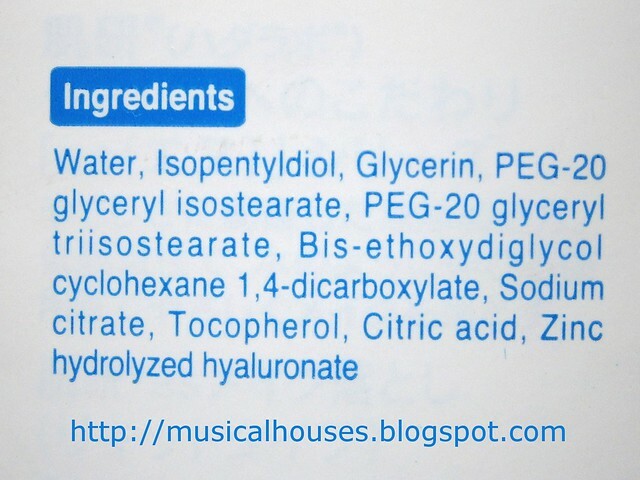 Hada Labo ES Lotion ingredients: This formulation will certainly hydrate your skin. Lastly, the ES Milk. Although Hada Labo suggests that the Lotion be used first, and then the Milk used after that, I feel like it's not strictly necessary. I suppose it would depend on how dry your skin is - if it is very dry, then applying both would be a hood idea. Otherwise, you could probably use the Lotion in the day and the Milk at night, or just use one or the other depending on how dry or oily your skin is. 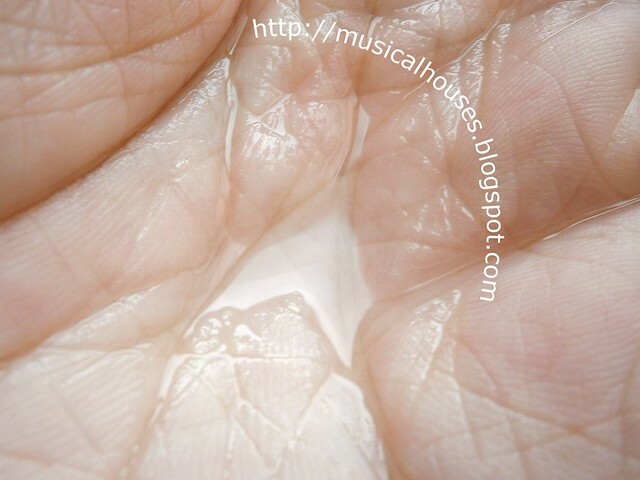 I think oilier skins might like the Lotion better due to its watery texture, while dry skins might appreciate the Milk. 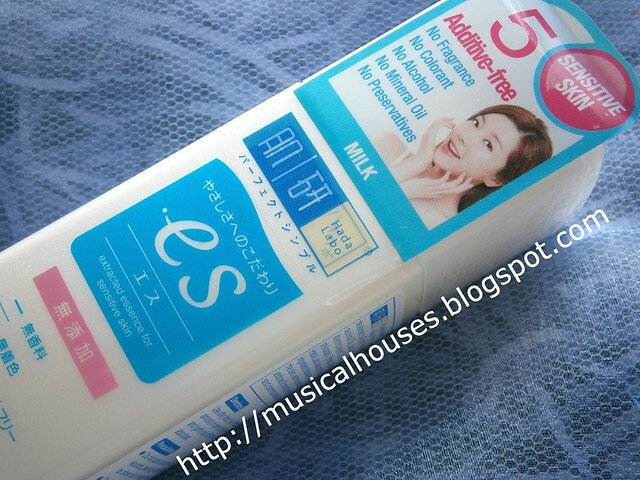 Hada labo ES Milk for Sensitive Skin: Intense hydration for sensitive skins. As the name suggests, the ES Milk is a white, milky looking liquid with a light gel texture - it's not watery like actual milk. This has a nice feel, and also absorbs into the skin, although perhaps it absorbs a little slower than the ES Lotion, and stays stickier on the skin's surface for longer. However, I felt like it was also more moisturizing than the ES Lotion. It's definitely the most luxurious product in the range, and very effective at hydrating the skin. So THAT'S why it's called a milk! The ES Milk has creamy white gel-like texture. Hada Labo ES Milk: High amounts of moisturizing ingredients such as squalene and caprylic/capric triglyceride mean that this product will hydrate skin intensly. So, looking at the entire range, would I recommend it? Yes - I think all the products work well and do what they claim on the bottle, and that the formulation is suitable for sensitive skin, and will help to hydrate your skin. If that's what you're looking for, then the Hada Labo ES range could be worth a shot. I'm sure most girls will love the ES Lotion and ES Milk, and I'm sure either one or the other, or both even, will suit your needs if you're looking for products that are easy to use and yet will deliver hydration to your skin. 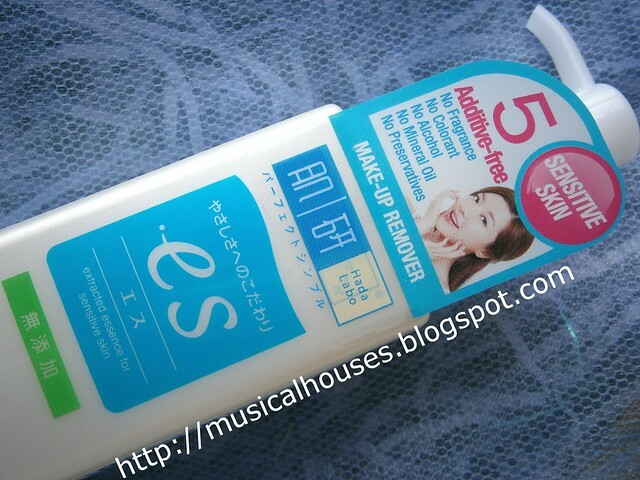 But don't also forget to check out the ES Makeup Remover, which was also a surprisingly good product for me. I have been hearing good things about the brand and have been dying to try them. Thanks for the reviews my dear, I think I will start off with the Makeup remover first. When I have completed my stash of skincare I'll move on to their other products. I would love to try their mosituriser. I must check this out at my local Mitsuwa! I love this entire range and have been using the products since late last year. The original HL didn't work for me. My skin is quite sensitive and the ES series is definitely much better. But I don't think they carry the makeup remover in Malaysia but am hoping they will bring it in. Thanks for such a detailed review. I have sensitive skin myself and I'm not sure why I haven't checked out the ES series since I've loved using Hada Labo. I'm looking forward to trying out the lotion in particular since my skin has turned super sensitive lately! Thank you for the detailed review. This will definitely help me decide whether or not to get one of these products. Saw it on one of the store shelves in a drugstore yesterday. Now, I should get 'em. Thanks again for this! Really enjoyed the review, judgemental and easy to read! Definitely trying this range out. P.s: i'd used hada labo foam cleanser (blue) on 2nd day of laser treatment and it dididn't irrirate the skin, this range is/should be very suitable for very sensitive skin! Don't mind me saying- spelling error at 'standard' and 'good'.. Cheers to the great review! @Anonymous: I think it should work for sensitive skin. For your oily skin, which product (Milk or Lotion) you would prefer would depend both on the level of oil in your skin (oilier skins can probably get the Lotion, but drier skins might like the Milk more), and how thin you want your product to feel on your face (again, the Lotion has a thinner consistency than the Milk). Hope this helps! I bought this line in Japan for my teenage daughter, not knowing much about it, other than it was marked for sensitive skin. Everything else is in Japanese (which I do not read) so your review was extremely helpful to us. Looking forward to using these products. I bought this line in Japan for my teenage daughter, not really knowing what each product was, other than it was for sensitive skin. I don't read Japanese and so your review helped immensely! Can't wait for her to give these a go. i've been using HL AHA/BHA since last month and it doesn't really worked well on my face. i think reading your review on hada labo es really helps me well. thank you so much or your review.